Barry Rubin: Syria: Is Iran Abandoning the Syrian Dictatorship’s Ship? Syria: Is Iran Abandoning the Syrian Dictatorship’s Ship? To dramatize their attempt to be recognized as a state by the United Nations, the world's most popular kleptocracy is making the rounds with a chair symbolizing what they consider their right to be seated with actual countries. The United Nations Charter promises that the organization's central principle is the equality of all men and women and of all nations large and small. The United Nations Durban Declaration and Durban conferences treat Israel differently than all other nations. The United Nations has violated that trust. The Palestinian Authority (PA) has refused to condemn an attack on Israel from Egypt by an al-Qaida affiliate group that killed eight Israelis. The PA is also going to the UN to get support for a unilateral declaration of independence that violates every agreement it reached with Israel since 1993. The PA leader, Mahmoud Abbas, has said that even if Palestinians get an independent state they will continue to demand that millions of Palestinian Arabs must be allowed to go live in Israel so they can turn that into a Muslim Arab state. Oh, and even when the PA declares that it is a Muslim Arab state (as it says in the PA Constitution) that it will refuse to recognize Israel as a Jewish state. And on September 20, the PA is organizing massive anti-Israel demonstrations that will probably lead to violence. Did I mention that the PA is currently in partnership with Hamas—even though that isn’t working out so well—which regularly attacks Israel with rockets and mortars, as well as declaring that it’s going to kill all the Jews? In effect, the Middle East is serving up the “Arab Spring Surprise.” Western observers see the dark, creamy chocolate covering. But it’s the steel bolts through the cheeks they’re going to get. Along with Roger Cohen, Nicholas Kristof and Thomas Friedman, the New York Times has another writer, Robert Mackey who is reliably anti-Israel. It's little surprise, then, that Mackey has weighed in on the recent firing of Larry Derfner by the Jerusalem Post with Israeli Columnist Is Fired for Writing That Palestinian Terrorism Is 'Justified'. Anyone familiar with Mackey's work would know that he would find plenty of support for Derfner from critics of Israel and not consider anything other than what those critics would say. One would also expect plenty of misinformation. A video has emerged of U.S. Ambassador to Syria Robert Ford being assaulted by a pro-regime demonstrator on the streets of Damascus last week. The assault took place before Ford's unapproved trip to the city of Jassem on Aug 23. Ford was present at a gathering of demonstrators who support the regime of Syrian President Bashar al-Assad outside the Cham Palace Hotel in Damascus when one demonstrator ran up to Ford and tried to wrap him in a poster that featured Assad's face. Ford's security intervened quickly and rushed Ford to his car. The incident was then replayed in a highly produced segment on a Syrian television station owned by Mohamed Hamsho, a businessman is the brother-in-law of the president's brother, Maher al-Assad. Hamsho was sanctioned by the U.S. Treasury Department earlier this month for siding with the Assad regime during its brutal crackdown on protesters. How often do you hear anyone - including these same NGOs - condemning attacks on the crossings? As angry rallies by Egyptians outside the Israeli Embassy in Cairo this week have shown, Israel's relationship with Egypt is fraying. A deadly exchange of rockets fired at southern Israel and Israeli airstrikes on Hamas-controlled Gaza this week showed the risk of escalation there. Damaged ties with Turkey are not improving. Cooperation with the Palestinian Authority in the West Bank seems headed for trouble. "We are witnessing a paradigm shift in front of our eyes," said a top Israeli official who spoke on the condition of anonymity. "Egypt was a major stabilizer in the region, and that may be over. Coordination with the Palestinian security officials could be lost. We are concerned about Turkey." A similarly themed article written by Joel Greenberg, Israel mulls ties with a changed Egypt was published in the Washington Post. There is a growing realization in Israel that maintaining ties with post-revolutionary Egypt no longer depends solely on cultivating the relationship with its leaders. Adopting stances that are more acceptable to ordinary Egyptians and the various political forces emerging in that country after Mubarak's ouster has become important as well. "There's a new factor now, the masses, who are setting the pace and dictating moves," said Binyamin Ben-Eliezer, a veteran politician and former defense minister long known for his relationships with Mubarak and senior Egyptian officials. The New York Times article, seems a bit better and more detailed. But both articles lack certain information. Neither article gives a sense that Israel sacrificed the Sinai and with it, strategic depth and a wealth of natural resources, in order to achieve peace with Egypt. Israel didn't simply rely on the goodwill of a corrupt and unpopular dictator. The growing influence of the Muslim Brotherhood isn't addressed in either article; the Greenberg article simply attributes it to "ordinary Egyptians and various political forces" without naming those forces. Similarly, Bronner doesn't mention that Turkey, under Erdogan has been moving away from Israel from well before the Mavi Marmara and that Turkey has been becoming more of a radical Islamic state. Neither article is especially bad, but neither fully describes the forces in play. Blogged from my Android, and reposted with permission. I don't think Derfner should have been fired. You are meeting tomorrow with the Palestinian Authority leadership. What is your message to them? There is one very simple question I would ask: Do you really believe you are a credible peace partner? Because I think with the reconciliation pact with Hamas, that is a very telling thing. The fact is that they are trying to back-door the process by going to the UN for a unilateral declaration of a Palestinian state, when we don't have a firm recognition of Israel, we don't have the renouncing of terrorism. I would also ask, what is a Palestinian state? It is something that never existed before.And even the word Palestine. You take it back to Palestina – which comes from Philistia – which was nothing but a declaration by Roman Emperor Hadrian in 73 AD. This is a region, it is not anything tied to a certain group of people; it would be just the same as saying we should have an Appalachian state, separate from North Carolina. It's those questions I'd like to ask. Supposedly now Abdel Basset el-Megrahi is near death (via memeorandum) His release two years ago, on humanitarian grounds, was a slap in the face to all those who lost loved ones in the Pan Am 103 bombing. It was also a slap in the face to the family and friends of Yvonne Fletcher. Yvonne Fletcher, 25, was killed when officials inside the Libyan Embassy in London opened fire on a demonstration. The Libyans inside the embassy were eventually allowed to leave Britain and no one has ever been charged with the crime. Libya's opposition National Transitional Council, which controls most of the country, is "fully committed to resolving" the case, a Foreign Office spokesman said on condition of anonymity because of government policy. Obviously this a maneuver to gain credibility in the West. It would, of course, be a positive gesture for the National Transitional Council to help Britain get those responsible. But doing the right thing here, shouldn't be confused with general righteousness. The council has every reason to make the apparently deposed Qaddafi look bad. Their actions when no self-interest is evident will be important. Readers of my column know that I have written repeatedly that the "Ground Zero" mosque would never be built for reasons having nothing to do with politics. The main financiers and the imam have gotten into one legal problem after another and Allstate Insurance Company is now launching a major lawsuit </a>for fraud against one of them. From the start, it seemed to me that the whole project was designed as something of a scam by shady characters to get lots of money from the contributions of the Saudis and others. In other words, the controversial and triumphalist aspects of the mosque were a public relations' scheme designed to win millions of dollars from the Muslim-majority world's millionaires. When the money didn't materialize--the controversy didn't help matters--the whole thing fell apart. And now a word from our sponsor: The "Ground Zero" mosque hoped for millions of dollars in Saudi and other oil money. We don't have the Saudis or George Soros, but the GLORIA Center is going to give you more accurate news and analysis on the Middle East than anything funded by them. So please give a donation, no matter how small, and it's tax-deductible in the US! Tax-deductible donation by PayPal or credit card: click Donate button: http://www.rubinreports.blogspot.com. Checks: "American Friends of IDC." "For GLORIA Center" on memo line. Mail: American Friends of IDC, 116 East 16th St., 11th Fl., NY, NY 10003. A wise president puts into effect policies that work. A smart president sees his policies aren’t working and changes them. Recently, the Egyptian minister of agriculture blamed the fact that some exported food products were infected with bacteria and killed almost 50 European consumers on an Israeli plot. The deputy prime minister explained that Muslim-Christian strife in Egypt (i.e,, Muslim extremists attacking Christians) is fomented by Israel. Internal conflict is generally blamed on the triumvirate of Israel, America, and Saudi Arabia. Today is Gilad Shalit's birthday. Here is a video from StandWithUs to commemorate it. I'm interviewed by Katherine Jean Lopez (KJL) of National Review (Watching Tripoli: Arab Spring Dominos Falling?). The text here updates very slightly the published text. KJL: Is there any question Qaddafi is going to leave Libya? How could that change things? RUBIN: The latest trends in the fighting are against him. More than at any other time, the rebel advance threatens his survival. And as we saw recently with the British, the NATO allies are intervening more to help the rebels win, going far beyond protecting civilians. Again, and this is not in any way to sympathize with Qaddafi, the NATO countries and the United States are doing nothing to protect civilians from the rebels. There is a lot of looting, wanton destruction, and human-rights abuses when they take over. No action or public protest comes from Europe or the Obama administration. Another interesting development is the clear tribal divisions among the rebels and the emergence of a Berber movement that might seek some autonomy if Qaddafi is defeated. But that war over who is going to rule Libya is a long way from being over. KJL: What are you most worried about in Tripoli? I have an apology to make for "The awful, necessary truth about Palestinian terror," which I posted here and on Facebook on Sunday. I didn't mean to say anything "good" about Palestinian terror against Israelis - I see nothing good in it whatsoever, and I thought I made that clear, but I see now that I didn't. Tel Aviv, Israel, August 26, 2011 — American human rights activists are launching a new social media campaign on Twitter to raise awareness of the plight of captive Israeli soldier Gilad Shalit. The grassroots campaign, titled #Tweet4Shalit, hopes to rally thousands of tweeters on the week of Gilad Shalit’s 5th birthday in captivity. Guy Goodwin-Gill, a lawyer who wrote an opinion opposing the Israeli security fence for the International Court of Justice in 2004 now writes a legal opinion challenging the PLO statehood bid. Rockets from the Gaza Strip continue to pound Israel. And much of the Western media blames: Israel. I want to explain again how this system works. What follows is a seven-point pattern that goes something like this: Someone shoots at your spouse, you punch the attacker, he yells, “Ceasefire!” then kicks you in the groin and takes some more shots at your spouse. You try to defend yourself. The police stand by doing nothing and then declare you to be the aggressor for breaking the ceasefire. This week's Latma is especially on target. A tenuous cease-fire between Israel and Palestinian militants in the Gaza Strip was punctured Wednesday by a deadly Israeli airstrike that triggered rocket and mortar fire at Israel. 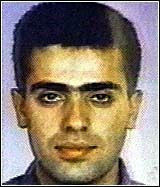 The airstrike killed one, Ismail Asmar, a leader of Islamic Jihad. What ceasefire did Israel puncture? Because of time restraints, this will be short. But I wanted to do at least a basic update on the situation here, with more hopefully to follow before long. After a three day period of relative quite, matters have heated up again. In the past 48 hours, there have been salvos of mortars and rockets coming from Gaza and aimed at Israel's south. We're talking about dozens of rockets, including Kassams and Grad Katyushas -- with some 20 shot during the night last night. Beersheva, Ashkelon, Sderot, Ofakim, Netivot and other towns in the region have been targeted. One baby was slightly injured and one house suffered serious damage. The Iron Dome defense system has taken out some of the rockets, but the terrorists launching them have attempted to overwhelm the system by sending a large number at the same time. There are two batteries of the Iron Dome currently in place and a third is scheduled for installation. 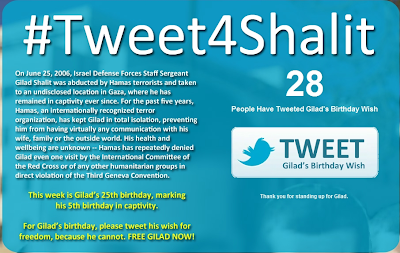 This coming week is Gilad's 25th birthday, marking his 5th birthday in captivity. Technorati Tag: Israel and Gilad Shalit. Is Now The Time For Israel To Take Back The Philadelphi Corridor? The state of Israel will not tolerate terrorism against its citizens, and the Israel Defense Forces will do all it can to protect the citizens of Israel. The IDF will not tolerate any attempt to harm Israeli civilians and IDF soldiers, and will not hesitate to respond with strength and determination to any element that uses terror against the State of Israel and until calm is restored. But so far, the response of the IDF has clearly been restrained--no Operation Cast Lead here. The question is whether the directed retaliation of the IDF will be enough to "protect the citizens of Israel" and ensure that "calm is restored". Who's Gonna Tell Hezbollah That The Hariri Tribunal Is Opening 3 More Inquiries? The U.N.-backed court investigating the 2005 assassination of former Lebanese Prime Minister Rafik Hariri has widened its probe to cover three other attacks they believe could be linked, the court announced Friday. At the height of the "Arab Spring" those who consistently recommended Israeli concessions for peace decided that this new unique situation demanded a novel, brave and dynamic approach--Israeli concessions. It is now 34 years since Israel agreed to turn the Sinai peninsula over to Egypt as part of the peace treaty signed by Menachem Begin and Anwar Sadat. Although many do not like to be reminded of it, Sadat was a dictator. The peace treaty survived his assassination four years later, when he was replaced by Mubarak. Whether it will survive the downfall of Mubarak is not clear at the moment. When it was signed, Arab dictatorships were considered to be a permanent feature of the Middle East. It seemed obvious that Israel had to make peace with Arab dictators, and that the formula for making peace with them was "territories for peace" - giving up territorial strategic assets for peace with a dictator. A few hours ago I wrote that the Egyptian military government reportedly told Israel that a major Israeli offensive into the Gaza Strip might create an out-of-control situation in Egypt. The Egyptian generals weren’t being threatening or hostile, they were saying that they could either not control a wave of violence that would result or perhaps be unable to resist demands for strong action. For this and other reasons, Israel has not retaliated. 1) The end of a chapter of history? Gaddafi’s downfall brings us closer to closing a dark chapter in Arab history — an era when dictators spent their vast oil revenue to finance international terrorism against the West as well as to suppress their own people. OPEC’s oil price revolution in 1973 started that era, which began to end with the overthrow of Iraq’s Saddam Hussein in 2003. Syria’s Bashar al-Assad is next in history’s sights. The ruling minority Alawite clan has used protection money muscled out of the Saudis and other Gulf Arab oil producers — and lavish payoffs from Iran’s regime — to give cash and arms to the killers of U.S. Marines, a former Lebanese prime minister and many others. The truth is that we don't know if this chapter is over. Will the new leaders be any better than the old ones? Though not Arab, Iran's rulers still seem well entrenched; Saudi Arabia's too. I thought this description, though, was ironic. Maan News Agency boasts that it is "among the most browsed websites in the Palestinian territories with over 3 million visits per month" and "Considered the main source of independent news from Palestine". So much the worse for the rest of us. The head of an emergency ward in a Gaza hospital said Monday that Israel was using new and more brutal weapons against the Gaza Strip, after a deadly attack Thursday in Israel. With the Old City wall’s to his right and in front of him, and the al-Aqsa mosque looming quite close on his right, Beck handled himself with a mixture of audaciousness toward his enemies and sensitivity toward his friends. He announced a global movement, to be headquartered in Texas, to encourage average people to act against injustice though the details of its scope and goals weren’t clear. As the world watches deposed Libyan ruler Muammar Gaddafi's forces take their last stand in Tripoli, western intelligence officials are trying to follow the trail of Libya's chemical weapons arsenal, and especially its mustard gas caches. To begin with, President Obama’s supporters are praising him for having overthrown Libyan dictator Muammar al-Qadhafi at no cost in American lives. I predict that the situation will break down within months into factional infighting, atrocities against civilians, and become a general mess. The main likelihood is not of an Islamist takeover but of rather nasty anarchy. While Obama’s team are crowing today they will be eating crow–or more likely be blaming somebody else–by early next year at the latest. Give Peace A Chance is a website created to present a short documentary about Israel’s legal rights in the context of the planned unilateral declaration of a Palestinian state at the UN in September. Below is a 15 minute documentary. You can also receive a more substantial written presentation about the same issue, authored by a respected international lawyer. You are encouraged to pass on this short documentary to friends and colleagues--it is important that historical facts and universal principles of international law are presented and upheld in the international community. – Give peace a chance by unconditionally returning to the negotiating table to peacefully solve the conflict in the Middle East. They believe that any lasting peace agreement between the Israelis and the Palestinians needs to be based on historical facts and international law and not on unilateral actions. The 15 minute film about a new perspective for peace between the Israelis and the Palestinians based on the discovery of the formerly classified minutes from the San Remo peace conference of April, 1920. This long hidden document explains the legal rights of the Jews as well as the Palestinians. By returning to the negotiating table and respecting historical facts and international law the film believes there can be real peace between Israel and the Palestinians. "When I went up the steps of the embassy, I thought of the blood of the Egyptian victims," that was how Ahmad A-Shahat described his "act of heroism," which won the support of the masses in Egypt – taking down the Israeli flag from its embassy building in Cairo. The unknown Egyptian managed to climb on the embassy's roof on Saturday, switch the Israeli flag with the Egyptian one to the cheers of thousands, and then burn the Israeli flag. A-Shahat may have been an "unknown Egyptian" at the time, but we'll have to see if Andy Warhol's rule applies to the Middle East. Meanwhile, back in the West, it seems that not everyone who abuses the Israeli flag gets hero status. ...Sheriff Charlie Macnair told Donnachie, a history student and member of the Scottish Palestine Solidarity Campaign, that he was satisfied he had behaved the way he had towards the Jewish student because Mr Reitblat was a citizen of the State of Israel. He said: "This flag was his personal property. I consider that your behaviour did evince malice towards Mr Reitblat because of his presumed membership of Israel. Apparently, words and actions really do have consequences in some parts of the world. This is a ridiculous conviction. I'm a member of anti-racism campaigns, and I am devastated that as someone who was fought against racism I have been tarnished in this way. That only goes to show you how cheap the price of admittance is to the glorious world of self-proclaimed anti-racist human rights activists. It also demonstrates the kind of behavior that is supposed to be excused by cloaking oneself in the mantle of a defender of 'anti-racism'. Scotland deserves a lot of credit. As for Donnachie, maybe Donnachie should himself consider going on a student exchange program? Technorati Tag: Israel and Egypt. I received an email that paraphrased Mark Levin's broadcast last night that by handing the ball off to NATO, and placing the US forces under their command, Obama by definition was not leading the operation as commander-in-chief. Footage is still emerging online of rebels seizing control of Moammar Kadafi's Tripoli compound on Tuesday, including some odd images of fighters with looted gold-plated guns. Isn't there anyone who is really optimistic about what comes next for Libya? I mean optimistic and knows what he's talking about. Many are ready to party about the political demise of the hated, eccentric, and foul Mu'ammar al-Qaddafi as rebel troops move into Tripoli. I am not partying. Here's why not. You can bet that the leadership in Iran and other countries; many Middle East media outlets; and revolutionary Islamist groups will proclaim that the earthquake that hit Washington and the area around it to be the work of divine intervention to smite the evil American rulers. Remember, this is the evil U.S. government of President Barack Obama, who thinks he’s proven himself the friend of Muslims and Arabs beyond any doubt. They will view it as proving that the final triumph of Islam is at hand. It would not matter much if a small fringe of extremists believed this but the size of that group will be far larger. To understand that this kind of thing takes place and is really meaningful is very hard for Western observers. Technorati Tag: Earthquake and Middle East. A senior cleric in the Egyptian Muslim Brotherhood has declared that ordinary Egyptians are obligated to kill 'Zionists' whom they encounter. According to Arutz Sheva Arab affairs expert Dalit Halevy, the pronouncement is part of a general wave of incitement that directly endangers Israelis who are currently in Egypt. I came across this and thought the issues were interesting, so I am passing it on, here. Daniel Pipes participated on an Australian Broadcast Corporation show, "Q&A: Adventures in Democracy" which covered a number of topics, including the Middle East and Israel. NGO Monitor is closely tracking NGO statements regarding the August 18 terrorist attacks in Israel. Amnesty International's statement makes a false comparison between the murder of Israeli civilians and the subsequent response of the Israel Defense Forces, and omits key details about the events. Our analysis was featured in the Jerusalem Post story below. The Jerusalem-based human rights watchdog organization NGO Monitor sharply criticized Amnesty International's response to last week's Palestinian attacks against Israeli civilians and soldiers, which resulted in the killing of eight Israelis and scores of wounded. Prof. Gerald Steinberg, NGO Monitor president, told The Jerusalem Post on Sunday that "instead of issuing a strong condemnation of the August 18 Palestinian terror attacks, Amnesty International's statement draws a false equivalence between cold-blooded murder and self defense that targeted those responsible." In a real sense, there was more intellectual freedom in the Arabic-speaking world in 1930 or 1940 then there is today. Long years of nationalist dictatorship have been more repressive than the oligarchical democracies of the pre-1952 (the year an Egyptian military coup brought in the era of Arab nationalist rule), while the power of Islamic and Islamist intimidation is far stronger today, being so well organized and ideologically self-conscious. Consider this little tale, which encapsulates a great deal about Multiculturalism, Political Correctness, and the folly of our contemporary world. Tahar ben Jelloun, born in Morocco, is a very successful writer in France. He migrated to France in 1971 at the age of 26. Technorati Tag: Middle East and Islamists. Interview by Rabbi Abraham Cooper of the Wiesenthal Center interviews Middle East Analyst Ehud Yaari, who gives analysis on the main reason behind Iran's Gaza Missile Gambit, Why Hezbollah is quiet (so far), the Post-Tahrir Sq trouble in Cairo--with over 100 groups urging the government to sever ties with Israel and Iron Dome's surprising- and promising results. The New York Times, which has had a history of shilling for the Qaddafi regime (that doesn't include this fawning profile of Aisha el-Qaddafi, Moammar's daughter, from April) is now celebrating Qaddafi's final hours. For more than 40 years, Col. Muammar el-Qaddafi has dominated and terrorized Libya — his image plastered on what seemed like every wall and his goons posted on every corner. Late Monday, with rebel fighters in substantial control of Tripoli, he was nowhere to be found, and his regime seemed to be collapsing. Barry Rubin: Libya: The Dictator Has Fallen! Long Live [Fill in the Blank]! Libya: The Dictator Has Fallen! Long Live [Fill in the Blank]! As NATO jets bombed the military positions of Libyan dictator Muammar Gaddafi, the watching rebels cheered, “Allah Akhbar!” Now that is a common Muslim expression, not just used by Islamists, and yet there is something symbolic about it. Allah did not bring the rebels victory, the United States and Europe did. Nevertheless, Allah will get the credit. And that means the triumph will be attributed to the rebels’ piety rather than the West’s warplanes. In political terms, Islamism is likely to be more attractive than a pro-Western stance. But that doesn’t mean Libya will be an Islamist state; it merely means it won’t be a democratic, pro-Western one. Continue reading Libya: The Dictator Has Fallen! Long Live [Fill in the Blank]! Technorati Tag: Libya and Middle East. All the talk of taking down Hamas, acting to create a strong deterrence, etc. etc. As flat now as yesterday's soda. One might think that it would be a substantial relief knowing that we have managed to steer away from war. But that relief is hard to come by when the truth is that we've not steered away from war so much as delayed it. And, just possibly, delayed it in a fashion that ultimately will make matters more difficult down the road. Things are slowing down, with expectation that quiet will be established soon. Or -- as I suspect -- is it just "relative" quiet that we're going to settle for? A great deal of unease remains. Lebanese State Prosecutor Saeed Mirza on Saturday denied reports made by one of the four Hezbollah members indicted for the 2005 assassination of former Lebanese prime minister Rafik Hariri that the government in Beirut knows his location but is unable to arrest him, Lebanon’s Daily Star newspaper reported. The first event in Glenn Beck’s series of events in support of Israel was an outstanding success, though walking through a minefield of sensitivities. Held in the historic Roman-build coliseum in Caesarea, the program mixed Christian and Jewish themes—stressing the commonality of world views and spiritual values. Beck estimated that 60 percent of the audience was Israeli and Jewish, and many of them were Orthodox, a sign that this community, at least in Israel, isn’t afraid of allying with Evangelical Christians In addition, Beck organized viewing parties around the world, including in some Muslim-majority countries where even watching a pro-Israel event over computers would have to be done in secret. The IDF has an updated timeline of what it is referring to as Terror in the South. Keep in mind that the times are given according to Israeli time. On Thursday, August 18, 2011, eight people were killed and at least 40 others injured in a string of terror attacks on buses, civilian vehicles and soldiers near the Israel-Egypt border. In a premeditated attack, terrorists from Gaza targeted Israeli civilians, who were 20km from reaching Eilat, a popular tourist destination for summer vacations. Following one of the worst terrorist attacks on Israeli civilians in recent years, terrorists in the Gaza Strip fired almost 90 rockets into major Israeli population centers. In response, the IDF targeted several sites of terror activity. The below post will be updated as this event continues to unfold. Follow @IDFSpokesperson on twitter for real-time updates. 01:14 - Hamas-run Gaza rocket just struck southern Israel community. Briefly, that's the sum of it. The situation in the South is fluid -- with outcome uncertain. There is an enormous feeling here in Israel that strong deterrence is essential. We cannot tolerate aggression against our civilians -- what is required is a rapid and painful response that delivers a message: You hurts ours, and you will suffer. Barak's comment today was, "You attack us, you lose your head." A good position. A necessary position. There is still confusion regarding some details of the terrorist assault by Gaza Palestinians affiliated with al-Qaida, from Egypt, into Israel, and then back into Egypt. Israeli survivors of the attack say the terrorists were wearing Egyptian army uniforms. Lebanon's representative to the U.N. Security Council said it would endorse a condemnation of the attacks only if the council were to condemn Israel as well, for killing the terrorists who planned the massacre. Lebanon refused to call the attacks “terrorism,” arguing that the attacks were not legally terrorism because one of the buses the attackers fired on had been carrying soldiers. This article was published in the Jerusalem Post. I own the copyright and have made some additions in this text to provide some fuller explanation of several points so I ask that you read and link to this version. Certainly, Beck makes silly mistakes on factual matters and details. Yet what’s important is that he comprehends the big picture. A Hollywood mogul once explained that he didn’t get headaches, he gave headaches to others. President Barack Obama’s determination not to give headaches to America’s enemies guarantees that he brings them onto U.S. interests. Here are examples happening right now and certain to blow up before the November 2012 elections. Early today the Hamas military wing, Izz al-Din al-Qassam Brigades, announced that the "lull" -- the informal period of quiet -- with Israel had ended. It has not been quiet for some time now -- with intermittent rocket attacks for which various "resistance" groups, but not Hamas itself, have claimed responsibility. Now a Brigades spokesman declared that any quiet is past, because of the "massacre" Israel is committing against the Palestinian people -- a reference to the retaliation by Israel following the terror attack near the border with the Sinai on Thursday. A gunfight is going on in the early afternoon of Friday between terrorists, probably from the Gaza-based Popular Resistance Committees, an al-Qaida affiliate, and the Egyptian army. The battle is taking place on the Egyptian side of the border near where terrorists killed 8 Israelis on Thursday. At least two suicide bombers have targeted Egyptian soldiers in the area. No casualty figures are available. It is estimated that between seven to ten terrorists are involved. On Thursday, Israeli forces believe that they killed seven terrorists, though two of the bodies are on the Egyptian side of the border. Official Israeli estimates now say 27 Israelis were wounded in the terror attack. The terrorists deployed four improvised explosive devices designed to kill civilians on Israeli territory. Two were captured intact by Israeli forces. So far, they are believed to be similar to those used in previous Palestinian attacks. Israeli forces attacked Popular Resistance Committee targets in the Gaza Strip. Among the dead was one of the group’s leaders. This group killed three U.S. government employees almost five years ago to the day. The men were security guards for State Department officials distributing scholarships to Palestinians in the Gaza Strip. The U.S. government at the time demanded that the Palestinian Authority, which then ruled the Gaza Strip, arrest and imprison those responsible. But while the Palestinian Authority promised to do so, no action was every taken and the men remained free. The U.S. government has taken no action regarding this terrorist attack or the PA”s refusal to help.